Be prepared for your nursing interview, use the sample interview answers to develop your own winning responses to these typical nursing job interview questions. Expect interview questions that assess your training, qualifications and work experience as they relate to the nursing job opportunity. 1. Where did you get your training and what qualifications and certifications do you have? You will be asked nurse interview questions around your work experience based on the resume you have submitted. This nursing job requires training and experience in ......... Tell me how your training and experience fulfill this requirement. Your resume shows that you have knowledge of ........ Please tell me more about your experience in this area. What is your experience in ..... Tell me in some detail how you went about performing this task? Prepare for these common nurse interview questions and you will be able to give effective and convincing answers that set you apart as an excellent candidate for the nursing job. 3. Why are you the right person for this nursing job? Highlight why your training and experience qualify you for this specific nurse job. 4. Why are you interested in this particular nursing job? Again prepare for this by finding out as much as possible about the job and the facility. "I am specifically looking for a position in a facility like this because of it's excellent emergency care ....."
5. What have been your most significant accomplishments to date? Describe achievements that relate to this nursing job. Take specific examples and describe how your approach benefited the patient and/or facility. 6. What do you consider to be your strengths and weaknesses as a nursing professional? Be honest about your weaknesses, show you have the maturity and insight to recognize your areas for improvement. This list of common workplace weaknesses will help you identify these areas for improvement. State a weakness and then discuss how you are managing it and the improvements you have made so far. How to find out what are your strengths? 7. What are three strengths that you bring to this nursing position? Make sure the strengths you identify are relevant to the specific nursing job opportunity. This complete list of workplace strengths will help you answer this common nurse interview question. 8. What are your future goals? Your answer should show your commitment to this job and facility. You can explain how this nursing job meets your long term objectives by providing an opportunity to grow and develop your nursing skills. Be realistic and select reasonable, achievable goals otherwise you will come across as a bit of a dreamer. 9. Why are you leaving your present job? 10. What do you consider the most important qualities for this nursing job? 11. What did you like and dislike about your previous position? The dislikes should not refer to characteristics of the nurse job you are interviewing for. 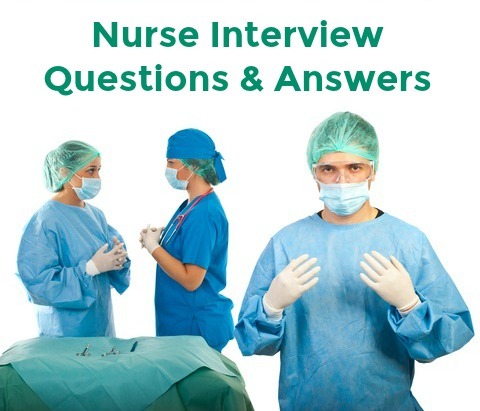 Expect nurse interview questions that explore your motivation for the nursing job and a nursing career. 12. Why did you choose your specialty area of nursing? Whether the area of specialization is ER, Occupational Health, Community Health, ICU or any other, the key to answering interview questions about your nursing career choice is to be very specific about why you chose it. what influenced you in your choice? how did you explore your options? Highlight how your strengths are best utilized in this area and how it suits your personal competencies. 13. Why do you want to work in our hospital and/or community? 14. How do you stay current with the nursing profession? Nurse interview questions about your motivation to learn and stay updated are important indicators of your commitment to nursing as a career. 15. What are the biggest challenges facing nursing today? Healthcare systems globally are struggling to meet the demands of the populations they serve. One of the major problems is the current shortage of trained nurses. Use your interview answer to demonstrate that you have thought about this issue and offer up some reasons as to why there is such a shortage of skilled nurses. You need to be able to show your interest in nursing as a career by demonstrating that you have thought about the current and future issues facing nurses. A number of nurse interview questions will be competency-based or behavioral interview questions. Go to this section to view behavioral nursing interview questions with answer guidelines. What questions should I ask in my nursing job interview? Prepare a list of good interview questions to ask in your nursing interview. How do I prepare for a nursing interview? Go through the typical nursing interview questions we have discussed and develop your own well constructed interview answers using our interview answer guidelines. Practice answering these sample nurse interview questions in mock sessions with a colleague, friend or relation until you feel comfortable about handling your nursing job interview. You can also expect a number of common job interview questions in your nursing interview. How to follow up properly after your nursing interview.